Cuts bills and footprint, educates children, and makes good use of roof space! Solar power and schools can be a good match. Helping insulate budgets from energy price rises on one hand. 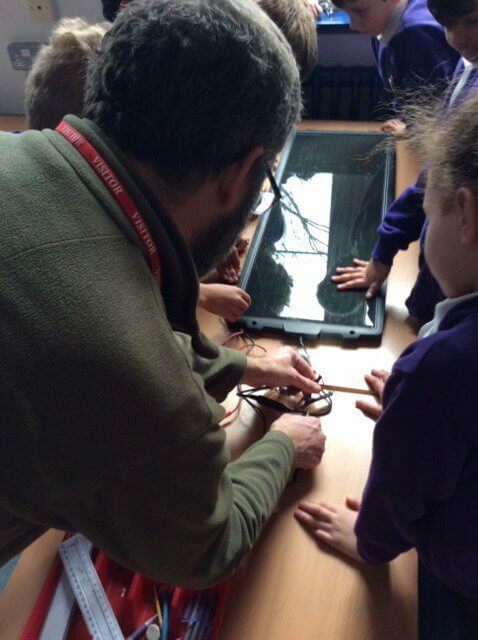 On the other, supporting science teaching around energy, climate change and the environment. Solar power is good for the school, for the surrounding area, and for the planet: having solar power means that we can burn less gas and coal to make electricity for the country, leaving more for other important uses and reducing the threat of climate change. King Athelstan putting its roof to good use! Even better, our local MP, Ed Davey, was able to come and declare it officially 'open'. He was Energy and Climate Change Secretary of State too. That had the nice side effect of some good PR for the school! King Athelstan's installation is solar PV, ie for electricity. It should cover about 10% of the school's consumption over a year. It will also reduce the need to import from the grid at all during summer days, especially weekends and holidays. 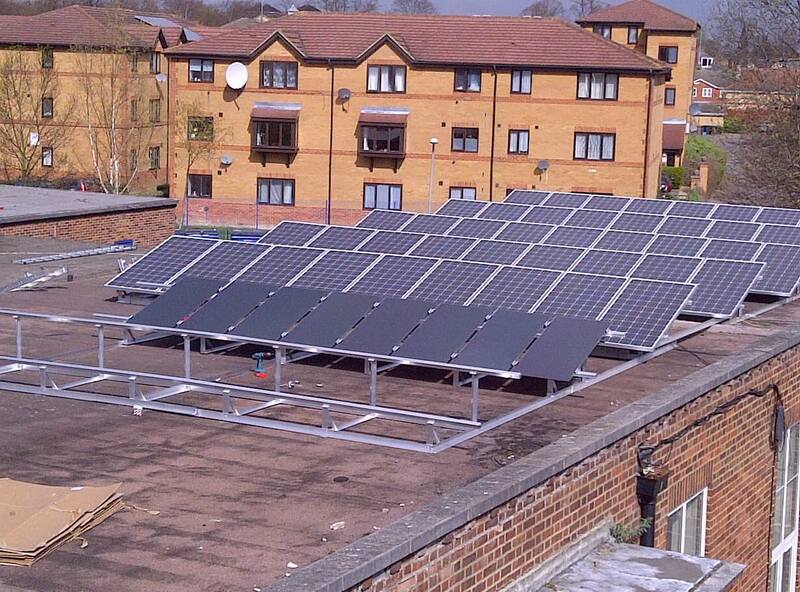 King Athelstan solar PV generation. 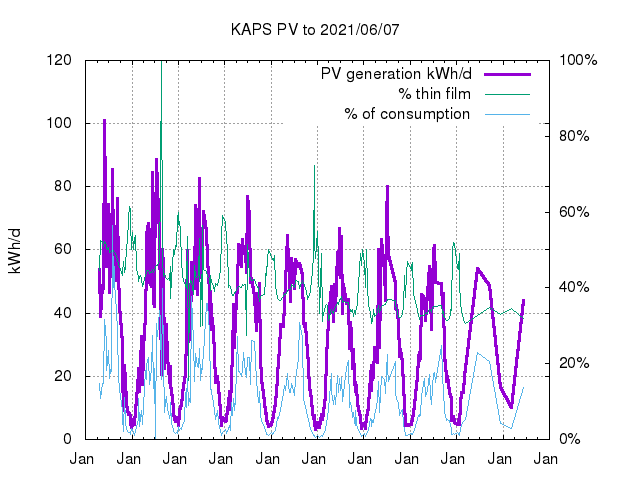 The red line on the chart shows electricity generation in kWh (units) per day. The blue line shows approximately what percentage of the school's entire consumption that is. The green line shows what fraction of the generation is from the "thin-film" panels. They are reputed to work relatively better than monocrystalline panels in cloudy/overcast weather. But keep an eye on the chart to see if that is actually borne out by experience. Note that when the sun is very low in winter shading from trees just over the Hogsmill to the south may confuse the issue. For other schools, eg residential establishments, a solar thermal system to contribute to hot water supply may also be useful. I used to love all the exhibits at the Science Museum in London where I could push buttons and pull levers as a kid. I'm hoping to put together some very simple exhibits King Athelstan and other local schools to use where kids can cover/uncover solar cells and watch meters twitch and motors whirr. Hardly likely to greenwash the children, but may generate a little interest along with the watts. I remember that my dad got me hooked on electronics with stuff not very much more complex! 2012/06/16: I'm putting together a very simple device with a small solar cell/panel (~4Voc, 0.25W) wired to a simple analog meter (Maplin LB08B 65&ohm;, 250µA FSD). There is a series resistor to protect the meter in bright sunlight. The cell and meter are in a clear plastic box stuck to opposite sides such that covering the cell with a hand has the meter drop back to zero. To get FSD (full-scale deflection) at (say) V=2.5V implies a 10k&ohm; series resistor. The meter can probably stand 100% overcurrent for a while. So something close to this or a little higher is probably fine, while giving decent needle movement even if not in bright sun. I've actually put a 3.3V white LED upstream of the meter, as a voltage limiter, with a further 470&ohm; to the solar positive. So if the light is really bright the LED comes on and limits the meter to FSD. Even though generating is good, not wasting is often more effective, particularly in terms of kg of CO2 saved per £ spent. In SWLEN's 2017/09 report Wasted Energy: how money and carbon dioxide could be saved in schools: it is noted at the end that [KA] "reminded to turn the heating to a frost setting over the Xmas / New Year holiday period saved around £500." All for about 10 minutes' work! 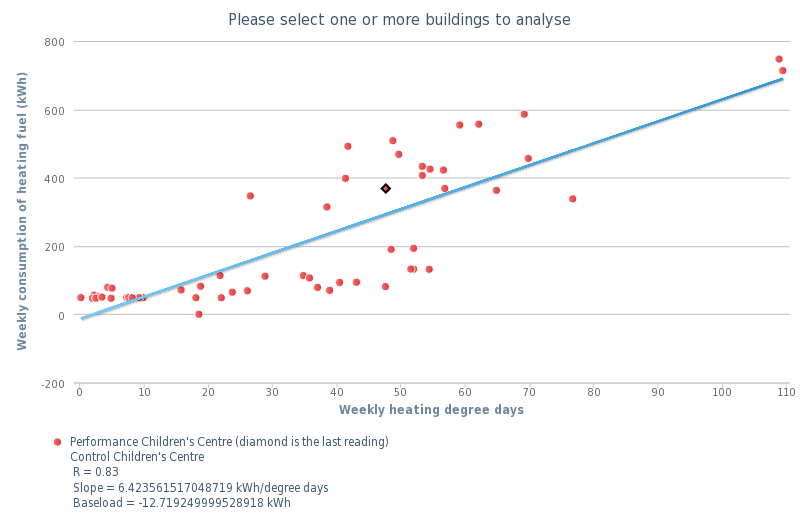 2017/09: Wasted Energy: how money and carbon dioxide could be saved in schools: "one school reminded to turn the heating to a frost setting over the Xmas / New Year holiday period saved around £500." 2012/11/21: Simple solution to energy hungry lighting: Surrey infant school cuts lighting energy consumption 50% with retrofit device. 2012/09/07: (efficiency-drive note) power consumed by one of KAPS PCs in sleep mode ~1.4W. Apparently all machines are on a programme to go to sleep at 6pm so only need to check (a) what happens at weekends (b) after long idle times during weekdays or on holidays, etc (c) what the monitors use while the PCs sleep and could/should they be on smart power strips. 2012/05/21: Ed Davey, Secretary of State for Energy and Climate Change was at King Athelstan Primary School for the official unveiling of its new solar PV (photovoltaic) system (pics of visit and install of monocrystalline and thin film parts; in press releases PSG Solar part 1, PSG Solar part 2, PV Magazine top in Google News). 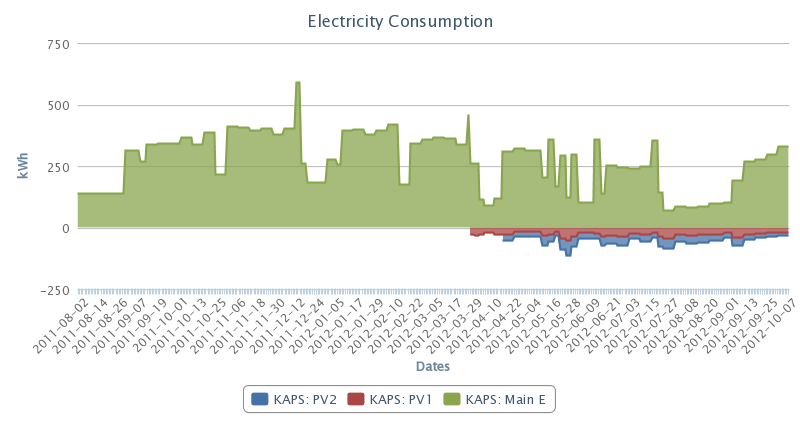 2012/11/20: KA CC heating efficiency to Nov 2012. SolarAid helps to combat climate change and global poverty by bringing clean, renewable power to the poorest people in the world. First published 2012-05-21 , updated 2019-04-22 . Site copyright © 2007-2019 Damon Hart-Davis. Hosted by ExNet.